Exiled Hamas leader Khaled Meshaal speaks at a news conference held in Damascus on March 15. 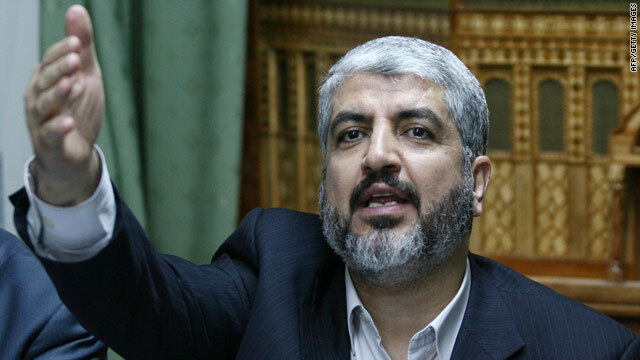 Jerusalem (CNN) -- Israel expressed "deep disappointment" Thursday over a meeting the Russian president held this week in Syria with exiled Hamas leader Khaled Meshaal. Israel's Foreign Ministry said in a statement that it expected Russia to stand by Israel in its struggle against Hamas. "Hamas is a terror organization whose declared goal is the destruction of the state of Israel," the statement read. "Hamas is responsible for the murder of hundreds of innocent civilians, among them immigrants from the Soviet Union and also Russian citizens." The statement continued, "Israel has always stood by Russia in its struggle against the Chechnyan terrorism. We expect the same attitude when we are talking about the Hamas terrorism against Israel." Russian President Dmitry Medvedev met Meshaal while on a visit to Damascus, Syria, on Tuesday, Russian news outlets reported. Medvedev called for the quick release of Israeli soldier Gilad Shalit, held in Gaza since 2006, when he was captured by Palestinian militants, including those from Hamas, Russia Today reported. He also called for reconciliation between Hamas, the militant group that rules Gaza, and Fatah, which rules the West Bank, Russia Today said. "Enlightened countries should not divide terrorists into good and bad according to geographical divisions," the Israeli Foreign Ministry said. "Terrorists are terrorists, and Israel does not see any difference between the terror Hamas activates against Israel and the Chechnyan terror activated against Russia. "There is no difference between Khaled Meshaal and Shamil Basayev," the Foreign Ministry said, referring to the Chechen warlord killed by Russian security agents in 2006. Russian Foreign Ministry spokesman Andrei Nesterenko responded to the Israeli statement with his own statement issued Thursday evening. "Hamas is not an artificial organization, but a movement based on the trust and sympathies of a significant number of Palestinians," Nesterenko said. "Our contacts with this movement are regular," he added. "We know that all other members of the Quartet on the Middle East maintain contacts with Hamas leaders in one way or another, although they are reluctant to admit this publicly, for some reason." The Quartet is a reference to the United States, Russia, European Union and the United Nations, which have been pushing for a peace settlement in the Middle East. Hamas spokesmen in Gaza and Lebanon told CNN the meeting was positive and showed that the group is a major player in the region. "This meeting is considered a huge change and jump in the relation of Hamas with great countries such as Russia, which is part of the (Middle East peace) Quartet," said Fawzi Barhoum, the group's spokesman in Gaza. "This is considered an international confession (that) an official in Hamas movement has direct influence on the conflict in the region." Barhoum called the meeting a trilateral summit because it also included Syrian President Bashar Al-Assad. The meeting, he said, "assures that the opposition power and resistance that is presented by Hamas and Syria today became a regional reality that has international dimensions. It is not possible to be marginalized from any part or power." "We believe the meeting was positive and has reflected how keen the Russians are in being in contact with Hamas, and that there is no hope on the horizon without dealing with the real players," Hamdan told CNN. "Russia has sent a message to the world that without the real players, there could not be any progress." Hamdan said the meeting tackled the "general Palestinian issue," the peace process, Israeli settlement building, the Jerusalem issue and the issue of Palestinian reconciliation. On the issue of Shalit, Meshaal told Medvedev that Israel has put up obstacles to any resolution, Hamdan and Barhoum said. "They [Israel] are using the methods of postponing, delay and shifting away from the subject for the public opinion of the Israelis," said Barhoum. "They do not want to confess to the public opinion of the Israelis that they are the main obstacle in [a] prisoner exchange deal." CNN's Kareem Khadder in Jerusalem; Nada Husseini in Beirut, Lebanon; and Maxim Tkachenko in Moscow, Russia, contributed to this report.